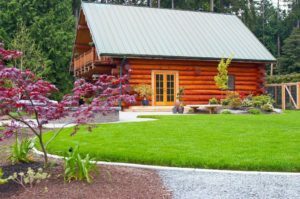 Landscaping around your log home is just as important as decorating the interior of the house. Not only can a well-designed and maintained landscape increase the resale value of your home, it also helps control sunlight, deflects wind, helps control log rot, adds beauty, creates additional living space and protects your privacy. Imagine what you want your landscaping to look like and what, if any, functional purpose you want it to serve. Browse through books and magazines on landscaping. Drive around your and surrounding neighborhoods, observe landscapes. 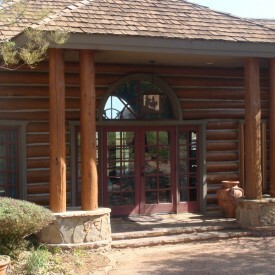 If available, visit model log homes for ideas. Consider any special needs you might have, such as storage, a playground for the kids, firebreaks for wildfire threats or plants that can survive water shortages. Decide how much or how little maintenance you wish to do. Evaluate the trees and shrubs already in place and determine which to keep. If you’ve built a log home in Australia and you need help managaing the trees around your property, take a look at www.treesurvey.com.au. Talk to local landscape companies like www.treewisemensc.com, they can be a wealth of knowledge! Keep planting beds generous and very gradual, so that walking or mowing at planting edges is easily accessible and one continuous gradual flow. 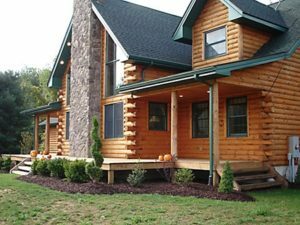 To prevent mildew and moisture-related problems, allow maximum amounts of sunlight and air movement around your log home. 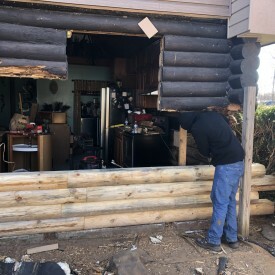 Plants and trees can act as a conductor for water onto your logs which can cause water damage to your log home. 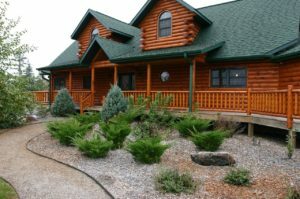 Be sure to plant shrubs and flowers at least three feet from the base of your log home. Consult with a professional on the distance needed for the type of tree(s) you are considering. Tree sap can compromise your logs and roof. Consider a trees growth, hanging features, etc prior to planting. You especially don’t want to grow any creeping plants like ivy on your logs, as that can lead to mold damage. Note: Locating a shade tree to the west of your home is helpful, since it blocks the harsh afternoon sun. Trees planted to the western side of your home also block northwest winds, which are very harsh. Something to also consider is to integrate hardscape features into your landscaping project. 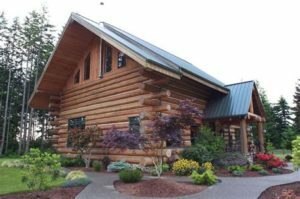 Natural and Man-made features mixed properly together can create a beautiful and picturesque setting for your log home, not to mention the lessening of your ongoing maintenance area. 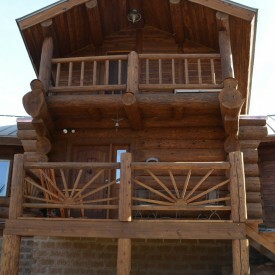 Best of luck as you beautify not only your log home, but the surrounding area!